NOTE: This section is in reference to the SAS October newsletter. If you’ve not read it yet, download it HERE. This is not only the second of the new newsletters, it represents a bit of a leap in technology as well. Part of the busy work of putting the September newsletter together involved generating hyperlinks for all of the interesting things mentioned in all of the articles so that you could simply click on a word you wanted more info about and BLAMO! you’re off to either the main article or, as you may have noticed from my previous website messages, right to the wikipedia page for everything anyone cared to provide. Well, it turns out that Word for Mac (OSX) will easily print/save PDF files, but it will NOT preserve the hyperlinks. While it may have been just as easy to buy a Windows computer (chuckle) and a copy of Microsoft Office (double), I’m pleased to report that Pages for OSX does a nice job of formatting AND PDF’s the hyperlinks correctly. If you see a word or phrase that appears in BLUE like this, you can click and, hopefully, your default web browser will open the webpage associated with the link. As you can guess, the printed version of this PDF does not ring the butler with the Encyclopedia Britannica when you touch the linked text. 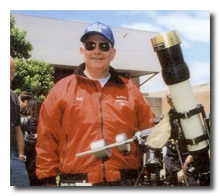 This October newsletter includes a review provided by Robert Godfrey, better known to NEAF attendees and many solar astronomy enthusiasts as “Barlow Bob.” The Great Barlow’ed One (if I may be so bold) is a member of the Rockland Astronomy Club, has been at the center of the NEAF (Northeast Astronomy Forum. Just ask Mike Brady and Ray Dague how much of their money never made it back to CNY) Solar Star Parties, and has been cited as responsible for more amateur astronomer’s interest in solar observing than anyone else I’ve seen online. We began a series of exchanges nearly a year ago and I was honored to find his kind remarks about our September newsletter in my email last month. In searching out other astronomy club newsletters during the formulation of the new SAS newsletter, I noticed that “Barlow Bob” appeared often. Among his many other beneficial astronomical activities, Bob makes his own writings of product reviews, history, observing, and events (including the NEAF Solar Star Party) freely available for astronomy club use. I’m pleased that the SAS newsletter is yet another periodical to benefit from Bob’s writings. The good Prof. Peter Plumley, exhibits projects manager for the MOST, has provided the dates for the two 2008 Space Science Speaker Series lectures in the Bristol IMAX Theater at the MOST (2009 dates coming). The first of these comes on Thursday the 30th, the far end of the tail that has already been comet October. This image shows how much the ground moved over the course of 1 day near Juneau, Alaska. The gray areas are water and the colored areas are on land. Each color cycle shows ground deformation 3 cm toward the overflying satellite. 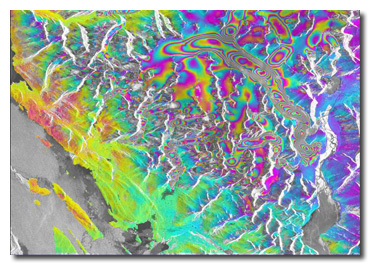 Areas with many color cycles show glaciers that are moving about 50 cm (20 inches) per day. The first lecture is from Prof. Matthew Pritchard of Cornell, who will be talking about his research, using satellites to look at Earth to provide bird’s eye (at various regions of the electromagnetic spectrum) views of geological changes on the planet. If you read Arthur C. Clarke’s 2001: A Space Odyssey, you know his original vision had Saturn as the central planet in the story of the monolith (it is reported that Stanley Kubrick could not make a realistic-looking ring system for Saturn and opted to use the simpler Jupiter. Clarke then wrote the sequels based on these, er, new coordinates). I wish not to ruin plot lines, but Clarke attributes Saturn’s ring material to the “engineering” of Japetus (Iapetus in other texts. Consonantal I = J in Latin) 3 millions years prior. Nothing new to see here, but still plenty to see. From NASA. Previous estimates put the age of the ring system at only 100 millions years (a surprise to me!). The relative “youth” of the rings had been proposed because, well, they look too dang good. To have the rings be as “bright and pristine” as they appear now in the presence of a Solar System full of colliding meteors and cosmic debris, the argument was that the rings had to be recent, meaning we were simply lucky to be here to see such an amazing spectacle. The central seam of the moon Japetus. From NASA. New simulations of the ring system, combined with observations from the Cassini mission, now predict that the constant bombardment of the rings by debris might break up the icy matter that constitutes the rings, but there is much more, and more massive, material in the ring system that can re-clump after being broken apart. 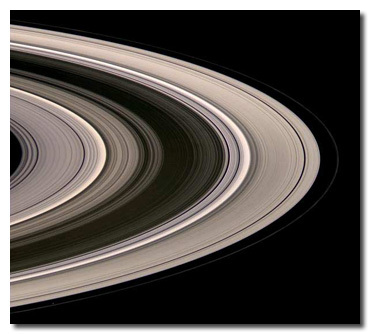 The rings are now believed to possibly be nearly as old as the Solar System itself. 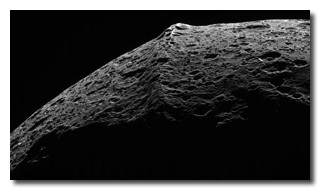 This does not make Iapetus any less interesting as a really weird satellite that shows a sign or two of extensive Celestial over-engineering. Perhaps our MOST lecture in November will provide more details! Let The Interstellar Wargames Begin! With all the phenomenal Hubble photos taken, it is nice to know that ground scopes can still take first prize in the imagination-spurring category. 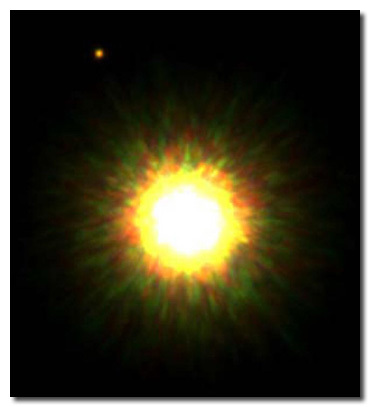 The image shown is the star 1RXS J160929.1-210524 and, of far more interest, its planetary companion. If the analysis is correct, this is the FIRST extra-solar planet ever seen, orbiting at a distance 330 times that of the Sun – Earth distance (known as an “Astronomical Unit.” Distant Pluto averages only 40 AUs). 1RXS J160929.1-210524. From the Gemini North Telescope. That large separation is the reason for the observation. Even with state-of-the-art equipment, we’ve not the resolving power to see planets (yet) at AU values that correspond to our own. This is also why the majority of extra-solar systems discovered involve massive planets, as they’re the only ones with enough mass to appreciably interact with their suns to make the characteristic “wobbling” or “dimming” signatures that are our evidence for planets. 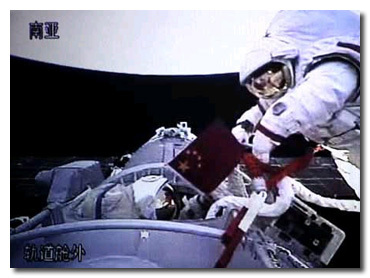 On Sept. 27, the Chinese (and Zhai Zhigang) became members of an exclusive club as the third independent nation to send an astronaut on an extra-vehicular excursion. Zhai joins Edward White (U.S,. June 3, 1965) and Alexey Leonov (former Soviet Union, March 18, 1965. The Alexey Leonov is the vessel sent to Discovery in Clarke’s 2010) as the first men of their nations to take a walk on the near-vacuum side. All dressed up and only one place to go. Zhai “outside” Earth. The extent to which the U.S. and China are on good terms is manifest in the relative lack of excitement (or concern) by the U.S. Public about the rapid progress of the Chinese Space Program. While I was two decades away from experiencing the whirlwind, I am aware of the ramifications on U.S. politics and science education that the announcement of the successful launch of Sputnik 1 brought. A vacuum dirtier. 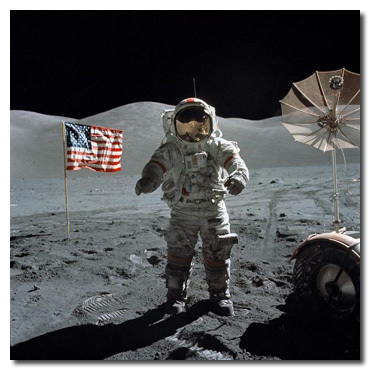 Harrison Schmitt of Apollo 17. From NASA. Far and away the most impressive video you will see on youtube today. The SpaceX company, started by Elon Musk of Paypal fame, has, in their fourth try, made history by putting the first privately-owned rocket into space. The Falcon 1 rockets that serve as the base for orbital endeavors have had their share of press for what didn’t go right, starting with their first sub-minute failure to their most recent (before this launch) timing error of the first-stage separation. 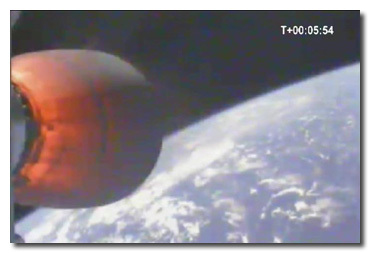 We are fortunate that the video feed from the rocket itself proves beyond shadow of doubt that 4’s a charm. The photo above is one frame from that video. To see the entire movie (and, more fun, to play it backwards quickly to get an even better sense of the take-off), click HERE to go to the youtube video.